The kids’ bathroom has been difficult to use since the day we bought the house. But other projects always creeped up the priority ladder. So I am excited about this project. What we thought would be an easy fix in 2008, turned out to be a project that required a complete tear out. 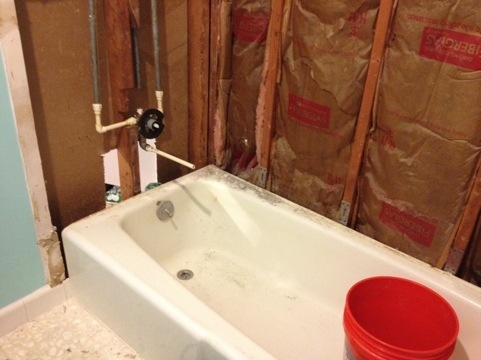 When the dishwasher died on Saturday, I thought the bathroom project would get demoted. But Chris figured out how to replace the dishwasher and fix the bathroom! Thank you Chris!! My only prayer right now is that this project doesn’t turn Chris off to home repairs like the last one (residing the front of the house).